After months of deep negotiations, General Motors has agreed to sell Saab to Spyker Cars NV. The smaller automaker will form a new company, Saab Spyker Automobiles, and could possibly compete with GM's Opel brand in the future. The automaker did not release details of the sale, but has set a 2 p.m. conference call with reporters to discuss the deal. GM had said it was beginning to wind down the brand, but analysts said that was likely just a negotiating move in the sale. The Swedish government intervened, sending dignitaries to Detroit to plead with GM to keep the brand open. The plant in Trollhattan, Sweden, employs 1,400 workers. 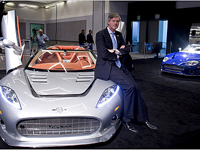 Spyker Cars N.V. is a Dutch hand-built automobile manufacturer. The company's motto is "Nulla tenaci invia est via", which is Latin for "For the tenacious, no road is impassable."